Guitar legend and Smart Man hero Les Paul passed away today from complications from pneumonia. He was 94. 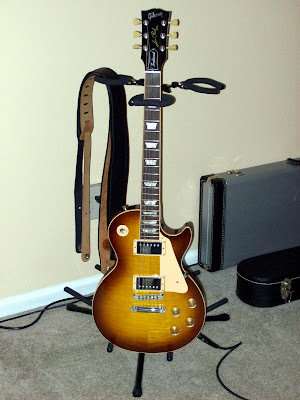 The Smart Man owns a Gibson Les Paul traditional in Iced Tea burst, in addition to his Stratocaster. As you can see, it's a beautiful instrument and he thoroughly enjoys it. Thank you, Mr. Paul, for you contribution to the music I love. You will be missed. Just heard that from another friend. There goes a large chuck of my adolescence. We'll miss you Les Paul. The embers of the fire he started will burn long into the night. Helluva musician, helluva inventor. RIP, Mr. Paul.